Police have released CCTV images of a man they want to trace a month after £16,000 worth of rings were stolen from a Peterborough store. At about 1.55pm on Tuesday 22 May three rings worth more than £16,000 were stolen from a jewellers in Queensgate, Peterborough. A man had entered the store, pretending to be interested in buying the rings - before grabbing them and running off. Officers are keen to speak with the man in the CCTV images and would urge anyone who recognises him to get in touch. 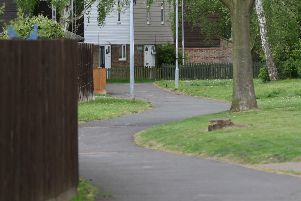 Anyone with information should report online at www.cambs.police.uk/report quoting 35/3222/18 or call police on 101. Alternatively contact Crimestoppers, anonymously, on 0800 555 111 or via www.crimestoppers-uk.org.